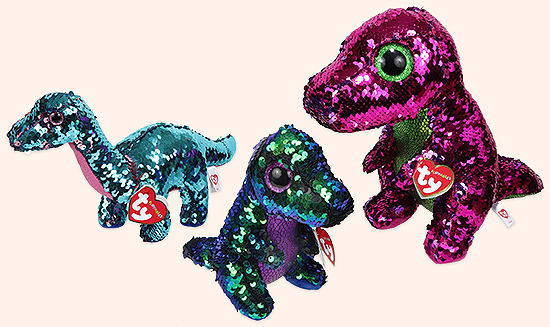 Flippables are plush animals covered with sequins. When you pet the sequins, they turn over to reveal a different color. The first three Flippables available for retail sale were the dinosaurs Crunch, Tremor and Stompy. They were available in regular and medium sizes. Ty submitted a trademark application for the name "Flippables" on May 30, 2018. The first Flippables for sale in the U.S.A. showed up at the Learning Express in Lake Zurich, Illinois.They were available in normal and medium size. 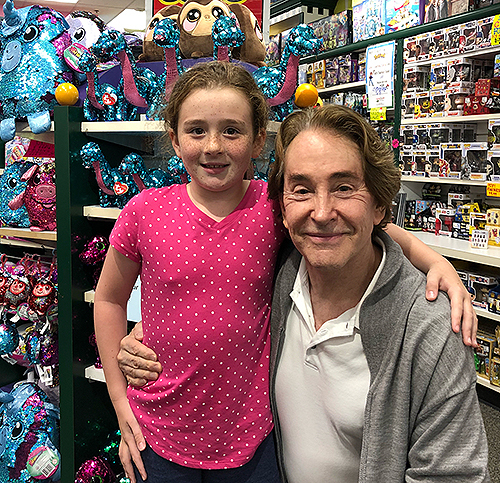 Ty Warner personally delivered a shipment of the first new Flippables to the Learning Express store in Lake Zurich, Illinois on July 3, 2018. The first customer was Lizzie, who had Ty sign the first one sold in the U.S.A. Note - Photo used with permission of Learning Express Toys of Lake Zurich, Illinois. The first overseas sightings of the Flippables were at the Toy Hub (store) in Scotland, and the Games Crusade store in North Yorkshire, UK, at the end of June 2018. Ty introduced clip and large sizes of the Flippables in January 2019. The new 2019 Flippables could only be ordered by retailers who attended one of the 2019 regional toy fairs. Technically, that makes them "toy fair exclusives." The only two Flippables at the beginning of 2019 that didn't need to be ordered at a toy fair were Tulip & Bonnie. At the beginning of 2019, authorized Ty retailers could no longer order the Flippables that were released in 2018.